Welcome to Down On The Street, where we admire old vehicles found parked on the streets of the Island That Rust Forgot: Alameda, California. 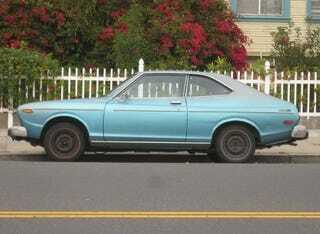 Here's a sight you won't see often: a survivor Datsun 710! Known as the Datsun 140J in Europe and the Nissan Violet in Japan, the Datsun 710 was priced between the sporty 610 and the bare-bones B210 in the North American market. You got a 100-horsepower L20 in your $3,469 2-door 710 in 1975, which was pretty steep compared to the $2,769 Pinto or the $2,786 Vega. In fact, $3,195 would have bought you a brand-new '75 Dodge Dart with a V8... but inflation and crazy gas prices were making the Datsuns look pretty good to car buyers back then. It's always fun when I can get more than one DOTS car in a single photograph, as we see here with the '73 BMW 2002tii in the background.